It's officially patio season, the time when we want to spend all of our time outside, cocktail in hand. I thought it would be wise to turn to a European tradition to uncover the health benefits of a particular (and delicious) drink. This drink requires nothing but a trip to your local liquor store or speakeasy. It features gin and bitter spirits. When we think of tastes, we know sweet, salty, sour and pungent. But we rarely think of bitter, the fifth and most often forgotten flavour. Sure, coffee and dark chocolate have a bitter taste too, but think of all the cream and sugar that we add to both to make them more palatable by covering the bitter taste. The bitter taste provides the greatest health and metabolic benefits by enhancing digestion and toning the internal organs. And yet, it's almost completely missing in North American culture. This could explain why we have so many digestive issues, such as IBS, gastric reflux (GERD) and even constipation... even skin conditions that are tied to digestion, such as eczema, psoriasis and acne. Because we're missing bitter! Your mouth produces digestive enzymes and saliva. Your stomach produces stomach acid and enzymes. Your liver and gallbladder produce bile; your pancreas produces bicarbonate. So for any of us who experience any of the conditions that I mentioned above, or even bloating, gas or discomfort after we eat, bitter can help. It's like that Buckley's cough syrup ad, "it tastes awful, but it works." In many cultures (especially Italian), a salad of bitter greens is eaten before a meal. If salads made from bitter greens are not your thing, a bitter cocktail is a great way to introduce the flavour in beverage form. 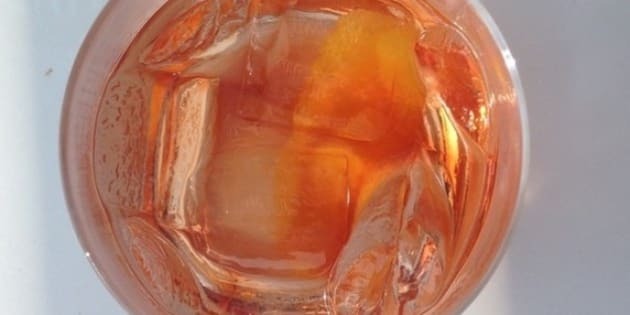 Lately I've been all over the Negroni, a lovely drink that originated in Italy. Some famous aperitifs include Lillet (from France), and Italian Aperol and Campari. The latter, which is used in negronis. But what all of these spirits have in common is that they are made with top-secret blends of aromatics, bitter herbs and fruits that open up our digestion. Aside from the science of bitters, having a drink before a meal can also help you relax like those lovely Europeans and get in the mood to eat. Research also suggests that alcohol, especially beer and wine, can help to stimulate the secretion of digestive hormones in the stomach . And some studies have found that people who have a drink before dinner are less likely to call in sick to work the next day due to stress reasons. This must have something to do with the fact that a post-work/pre-dinner cocktail signifies an end to the work day's stress. So try this lovely bitter cocktail before a meal and test out the bitter flavour for yourself. All the old Italian men do it, so you should, too. Just make sure you don't drink too many -- the benefits of drinking alcohol decrease as consumption increases. Add to a glass full of ice and stir to mix. Add a slice of orange peel to garnish and sip before a meal. Here's to drinking healthfully and responsibly.